Our seniors deserve the best possible care so that they can be independent and live life on their own terms. I am passionate about PACE and want to ensure that InnovAge provides responsible patient care and clinical excellence for all participants. Maria Lozzano joined the InnovAge team in 2018. As COO for western regional operations at InnovAge, Maria is based out of San Bernardino and works closely with InnovAge operations leadership to support the growth of the organization. Maria has more than 11 years in healthcare operations, most recently as chief operations officer with VNA California. The home health, palliative care, and hospice organization serves 800 people in Riverside and San Bernardino counties in California, and Maria oversaw the 300-member team that delivered these services. 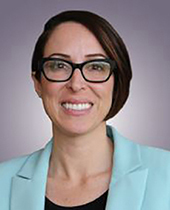 In addition to VNA California, she has also worked with acute, chronic, home infusion pharmacy, and in-home surgical aftercare organizations, and has experience with business development and in leading clinical operation teams.